Here we go with another week’s worth of some of the best personal finance posts that I have seen. I usually try to keep it to about 4 or five of them, but there is quite a good bit of good content out there. Unfortunately, there is also some not-so-good content out there, so I try to do some of the weeding out for you. Anyways, here ya go, some of the best stuff I’ve read this past week. My Money Blog-Here are some good tips on Roth vs. Traditional IRAs. Canadian Finance Blog-Just discovered this one. Here, get some good advice on how to save money on household appliances. Get Rich Slowly-Another great article here from one of my personal favorites about how to break out of your professional comfort zone to make more money. Bible Money Matters-A good article on the topic of giving and donating and the role it plays in our daily life. Hope these prove to be useful. Feel free to comment on any of them, or any of my posts you find compelling, in the space provided below. Is It OK To Use A Coupon On A First Date? My Reports "10 Ways To Save During Tax Time" and "The Art Of Grocery Shopping" are yours FREE when you sign up below for my somewhat monthly email roundup and blog updates. 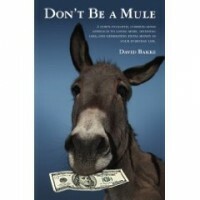 Don't Be a Mule: A down-to-earth, common-sense approach to saving more, spending less, and generating extra money in your everyday life.